In scanning the boating news from local newspapers (i.e. news websites) from around the country over the past few days, we found that boaters basically have to be vigilant of almost everything! Beyond the boating safety basics you normally have to worry about – wearing a life jacket, filing a float plan, checking the weather, etc. – there are also special hazards, unique to your boating community, that you must be aware of before you boat. We’re talking about large sea creatures, submerged pilings, abrupt changes in water levels, and pirates, to name a few. What is there to watch out for you ask? This one is for a large portion of the US and all of Canada this time of year. Just yesterday we got a lesson from a district captain in the United States Coast Guard Auxiliary about the dangers of boating in cold water and tips on how to survive if you end up out of your boat. If you’re a coastal boater you may not think about these things, but dams could give you both the greatest fishing and the most dangerous boating experience of your life. Water levels below the dams can change suddenly as generators are turned on or off. Horns and flashing lights, in place to alert boaters, often do not work or go unnoticed before it’s too late. If you fish or boat anywhere near a dam of any size, read this article about the Shoals in Alabama on the Tennessee River. Boaters on the Sandy River in Oregon are being warned to watch out for submerged pilings at the site of a four-year construction project to build a new bridge. The Gresham Outlook reports that the pilings for a temporary work bridge will remain in the river this winter, although the deck has been removed. November is Manatee Awareness Month in Florida, and lower speed zones are in effect throughout many boating areas of South Florida until March 31 as these friendly sea cows meander to warmer water for the winter. This article in the Sun Sentinel includes tips on how to spot a manatee and mentions some of the hotspots where manatees like to congregate. 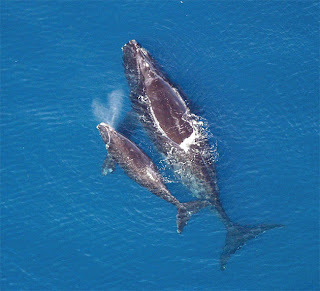 It seems like only yesterday we were warning of whales off of Cape Cod, Massachusetts, on their way up to Nova Scotia. Now, according to the Atlanta Journal Constitution, the endangered Right Whales have done their annual about-face and are back to their winter homes along the coast of Georgia, where ships and recreational boaters need to be careful not to collide with them. Got a local boating hazard to report? Comment on the Daily Boater, send it to us via the Send Us News link on DailyBoater.com, via FirstBoat on Twitter, or post it to our FirstBoat page on Facebook.